It is said that 1,300 years ago, on the peaks of Mt Horai lived an ascetic monk and hermit called Rishu. 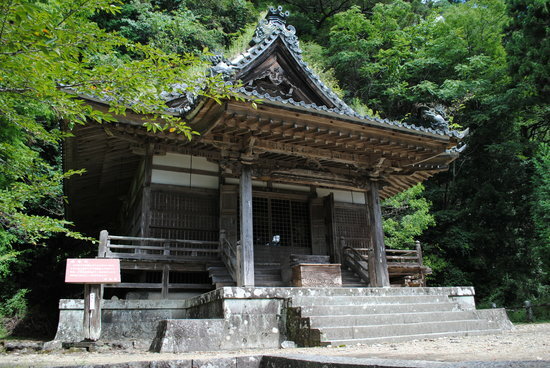 According to temple tradition, Rishu founded the Horaiji Temple in 703. With the winding stone staircase temple approach of 1,425 steps and surrounding primeval wood of cryptomeria cedars, and cypresses, the mountain is a magnificently mystical setting for mountain ascetic practitioners. 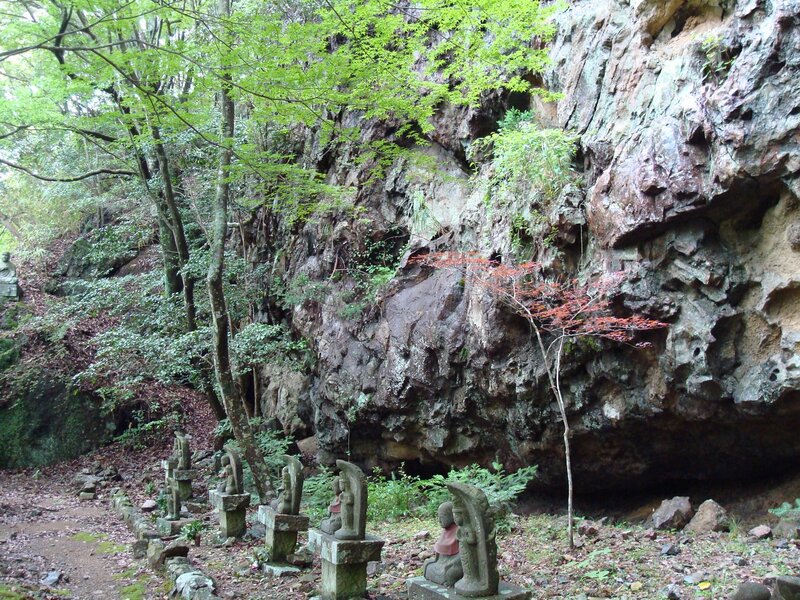 It has been a popular spot for pilgrimages, especially during the Edo Period. Mikawa Province, Horaiji Temple by Ando Hiroshige. The Temple belongs to the Shingon Buddhist sect, but its founding by the obscure mystic Rishu inexplicably shows dates that are earlier than the late 8th century origin of of Shingon Buddhism usually attributed to the more famous monk Kukai. 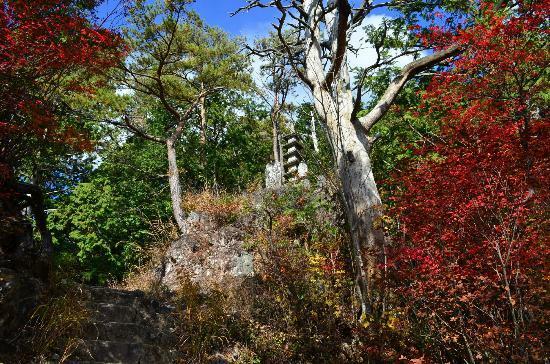 Local legends cast a pall of mystery over the mountain temple’s early background. Below is a conflated story from two accounts of the origins of the miracle hotsprings of Yuya valley as well as the founding of Horaiji Temple. Around 1300 years ago, a Buddhist monk named Rishu was said to have happily discovered a natural hot spring bubbling to the surface of the Yuya valley in what is today’s Aichi prefecture. Rishu according to some accounts, was at the time already residing in the mountains when the 42nd Emperor of Japan whom we know to be Emperor Mommu and who was very ill at the time.. Trained in the Buddhist arts of healing, Rishu was called upon to find a cure for the Emperor and supernaturally carried away by a phoenix to the royal palace. At the palace, the monk worked hard for 17 days and the Emperor successfully made a full recovery. 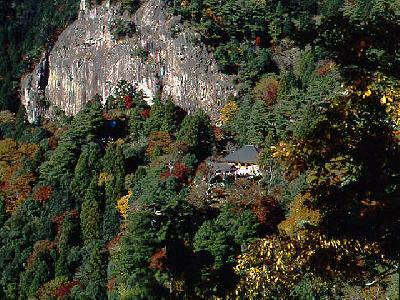 As a reward for his work, the monk was allowed to establish the Horaiji Temple (which means ‘Phoenix Come Temple’) in the mountains above the Yuya hotsprings. Now, dwelling on the peak of Mt Horai didn’t make it particularly convenient for Rishu to visit the hotsprings that he so favored. So he levitated his way down the mountain. Swooping powerfully down from the peaks of 684m-high Mt. Horaiji like a kyarobinga, and yet gracefully poised like an apsara with his robes gracefully flapping around him and all the while playing his flute, was how Rishu would visit the hot spring waters near the Ure River. 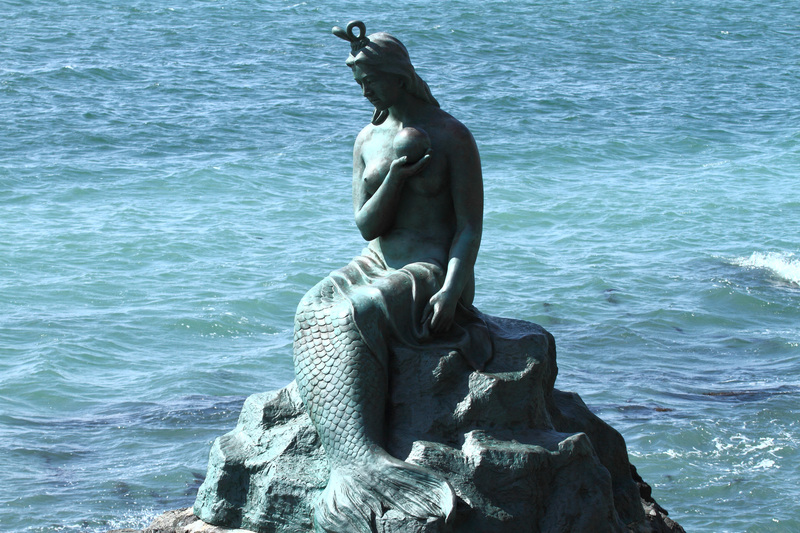 This unusual method of travel and the holy monk’s frequent dips made such an impression on the locals, that they thought it opportune to open bathhouses there, in the belief that these would be waters with magical healing powers. Now there’s a tale that could have given a movie such as Crouching Tiger, Hidden Dragon a run for their money. Modern pilgrims today still visit the mysterious mountain maybe supposing the place to be still infused of magic and the supernatural … locals say the local birds (Japanese scops owls) chant paeans to Buddhism in the late spring and summer: “Bu!” (Buddha), “Po!” (sutra), and “So!” (priest). And tourists and pilgrims still visit as well the hotsprings in Yuya Valley for its medicinal waters that are reputed to cure everything from rashes to cancer. Was there really a hermit monk Rishu? According to tradition, the founding of the Horaiji Temple is associated with Shingon Buddhism and with the historical figure 42nd Emperor Mommu (683–707), as well as the fact that Yakushi mystic cults were proliferating (see pp. 564-567 Ancient Buddhism in Japan), and temples tended to be associated with Yakushi-cults exactly around this time … all appear corroborate the existence of an ascetic hermetic monk such as Rishu around the turn of the 8th century. The more fanciful embellishments of Rishu’s character, and the crediting him with wizard-like powers, appear to be consistent with the activity of the popular Yakushi Cults in an Age of Mysticism. “In A.D. 702 (XII 13), when the Emperor Mommu was ill, a great amnesty was granted throughout the Empire, a hundred men were caused to become monks, and order was given” for the monks to be sent to the provinces. During A.D. 702 (2nd year of Mommu Tenno, II 20) “Provincial Masters” (kokushi, were appointed in all the provinces…, in A.D. 685 (10th month), this sutra was expounded in the Palace, evidently in order to cure the Emperor Temmu, who died the following year (IX 9). Other sutras used for this purpose were the Yakushikyo (686, V 24), the Konkwomyokyo (686, Vlll 8) and the Kwannongyd (686, VII 28, VII 2); vegetarian entertainments of monks, penitential services (kekwa), offerings, dedication of a hundred Kwannon images general amnesty, everything was done in vain to save the Emperor’s life. As seen above (Ch. I, § 10), in A.D. 686 (V 24) “the Emperor Temmu’s body was ill at ease. Accordingly the Yakushikyo was expounded in the Temple of Kawara, and a retreat (ango) was held within the Palace”.’ As to the Yakushi-kekwa or “Rites of Repentance in worship of the Healing Buddha” not only Yakushi-kekwa were practised in all Nihongi, Ch. xxix, p. 541; Aston II, p. 376. Sacred to the worship of Horaiji Temple is the Yakushi-Nyorai (the Healing Buddha) a.k.a. the Buddha of the Master of Medicine). Yakushi-Nyorai was among the first of the Buddhist forms or representations to arrive (the other being Miroku) in the 6th century from the mainland continent, and he quickly became popular throughout Japan as a powerful deity who could cure sickness and eliminate earthly suffering– Yakushi remains one of the most cherished Buddhist figures in Japan today. Yakushi’s full name is Yakushirurikō 薬師瑠璃光, which means Medicine Master of Lapis Lazuli Radiance. The practice of venerating the “Medicine Buddha” in Japan is traceable to Northwest India, via China which had practised a sinified form of Bhaiṣajyaguru, an Indian bodhisattva who had achieved Buddhahood, to become the Buddha of the eastern realm of Vaidūryanirbhāsa, or “Pure Lapis Lazuli”*. The Medicine Buddha is often depicted with a lapis-colored jar of medicine nectar in his left hand and in the related sutra, he is also described by his aura of lapis lazuli-colored light. Sanskrit manuscripts of the Bhaiṣajyaguruvaiḍūryaprabhārāja Sūtra have been found at Gilgit, Pakistan prior to the 7th century and also at a Bamiyan monastery, Afghanistan, in the 7th century CE — attesting to the popularity of the Medicine Buddha in the ancient northwest Indian kingdom of Gandhāra as well as in Pakistan and Afghanistan. The same mystical tendencies seen in India, Tibet and China were also evident in Japan with Yakushi cults. The Yakushi Buddha was venerated by many powerful men including Takeda Shingen, a daimyo of the 16th century, as well as Tokugawa Ieyasu, powerful shogun of the 17th century. 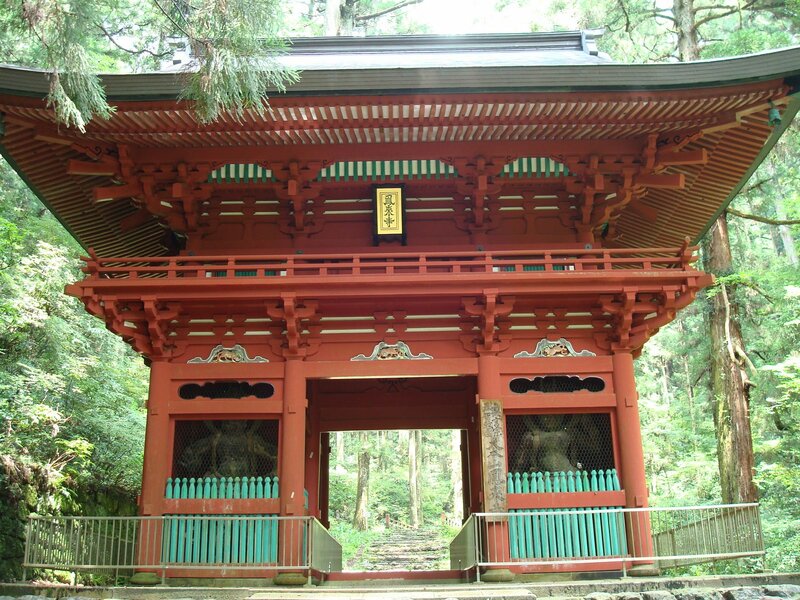 Apart from Horaiji Temple, the Toshogu Shrine also stands venerated on the slopes of the Horaiji mountain, a Tosho-gu Shrine built in the 17th century by the third shogun Tokugawa Iemitsu for his father, Ieyasu, to the east of the main temple. The interior walls of Tosho-gu are decorated with elaborate carvings that resemble those in Tosho-gu Shrine in Nikko, Tochigi. The religious site is said to have been particularly venerated by the Tokugawa family, upon Tokugawa Ieyasu’s mother’s conception of her son after praying there. But the influence of the temple declined after the mid-19th century with the end of the samurai rule of Japan. The main building of Horaiji burnt down many times, the extant building was completed in Showa 49. Today, the main historic relics that remain of the sacred site are the sanctuary, Nio-mon (“Deva King Gate”), bell tower, Okuno-in (inner shrine), Ko-do (small hall), and two small annexes. However, the discovery of ancient ritual relics such as an old mirror is thought to substantiate the actual antiquity of the site as a historical spot for pilgrims’ and ascetics’ rituals and provide evidence of human inhabitation on the mountain since early times. Mt Horaiji, located on the southern edge of dormant volcanos in Okumikawa, Shinshiro, Aichi Prefecture. Formed by volcanic lava 20 to 15 million years ago, the mountain consists of dacite, pitchstone and so on. 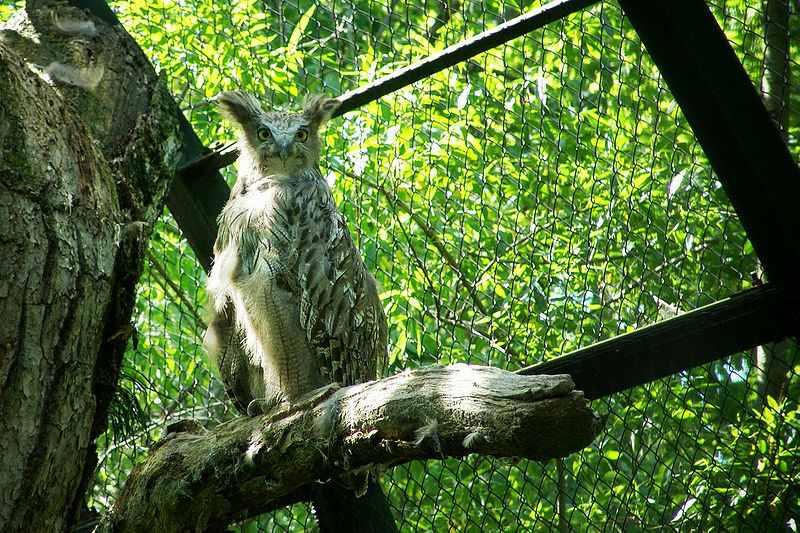 The mountain is famous as a habitat for scops owls, and at the end of a rigorous climb to the top of the mountain, the panoramic view of the forested hills of the East Mikawa Plain stretching all the way to Mikawa Bay. Visitors will combine their temple pilgrimage with a visit to the Yuya Onsen, a popular rustic hotspring resort in the 18th century 5 km. 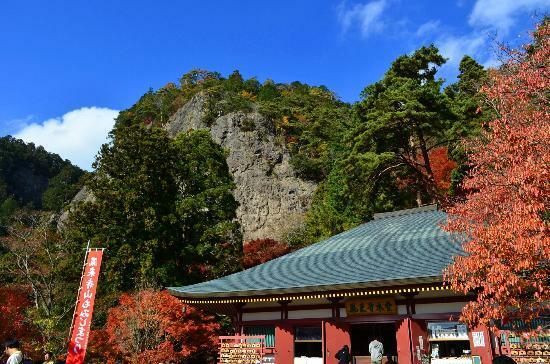 Or they will want to hike the beautiful prefectural park and for the spectacular autumn colours of the Aichi Kenmin no Mori in early November, all within easy walking distance of JR Yuya Onsen station. Many campsites are to be found (eg. the Kenmin no Mori campground nearby the Yuya Onsen station) as well as the Youth Travel Village at the base of Mt. Horaiji (which offers tents and bungalows, as well as auto camping sites). Horai-ji located in Horai-cho, Aichi Prefecture. [Rail] 1h 20 min from Shin-Osaka to Toyohashi Station by Shinkansen. From Toyohashi Station, southeast of Nagoya on the Tokaido main line, take the JR Iida line to Yuya Onsen station (about 70 minutes by local train, or 46 minutes on the Inaji limited express). For Horaiji, exit at Honnagashino station instead, then board the (infrequent) Toyotetsu bus to either the Horaiji stop (an easy 15-minute walk to the temple) or the village at the base of the Horaiji staircase.